A team of scientists led by Mohamed Sahnouni, archaeologist at the Centro Nacional de Investigación sobre la Evolución Humana (CENIEH), has just published a paper in the journal Science that breaks with the paradigm that the cradle of Humankind lies in East Africa, based on archaeological remains found at sites in the region of Ain Hanech (Algeria), the oldest currently known in the north of Africa. For a long time, East Africa has been considered the place of origin of the earliest hominins and lithic technology, because up to now, very little was known about the first hominin occupation and activities in the north of the continent. 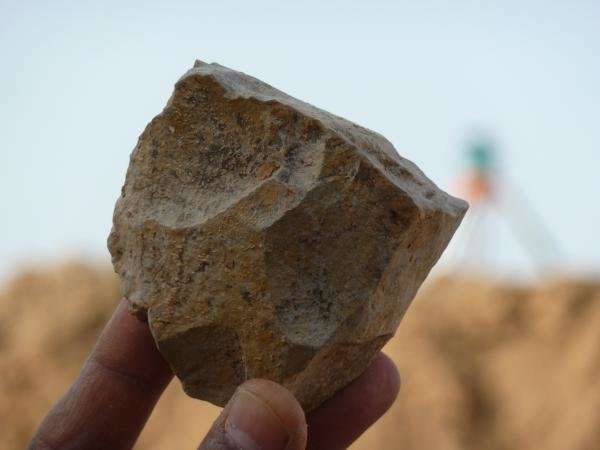 Two decades of field and laboratory research directed by Dr. Sahnouni have shown that ancestral hominins actually made stone tools in North Africa that are nearly contemporary with the earliest known stone tools in East Africa dated to 2.6 million years. These are stone artefacts and animal bones bearing marks of cutting by stone tools, with an estimated chronology of 2.4 and 1.9 million years, respectively, found at two levels at the sites of Ain Boucherit (within the Ain Hanech study area), which were dated using paleomagnetism, electron spin resonance (ESR), and the biochronology of large mammals excavated together with the archaeological materials. Paleontologist Jan van der Made of the Museo Nacional de Ciencias Naturales in Madrid used fossils of animals such as pigs, horses and elephants from very ancient site to corroborate the ages yielded via paleomagnetism obtained by geochronologist Josep Parés, and ESR conducted by Mathieu Duval of Griffith University. The artefacts of Ain Boucherit were manufactured of locally available limestone and flint and include faces worked into choppers, polyhedra and subspheroids, as well as sharp-edged cutting tools used to process animal carcasses. These artefacts are typical of the Oldowan stone technology known from 2.6-1.9 million-year-old sites in East Africa, although those from Ain Boucherit show subtle variations. 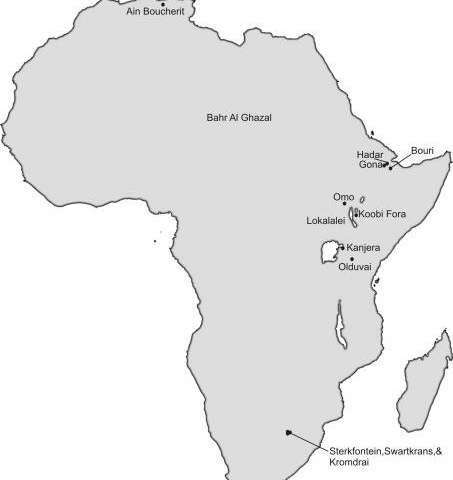 "The lithic industry of Ain Boucherit, which is technologically similar to that of Gona and Olduvai, shows that our ancestors ventured into all corners of Africa, not just East Africa. The evidence from Algeria changes the earlier view that East Africa was the cradle of Humankind. Actually, the whole of Africa was the cradle of humankind," says Sahnouni, leader of the Ain Hanech project. Ain Boucherit is one of the few archaeological sites in Africa that has preserved evidence of bones with associated marks of cutting and percussion in situ with stone tools, showing unmistakably that these ancestral hominins ate meat and marrow from animals of all sizes and skeletal parts, implying skinning, evisceration and defleshing of upper and intermediate extremities. 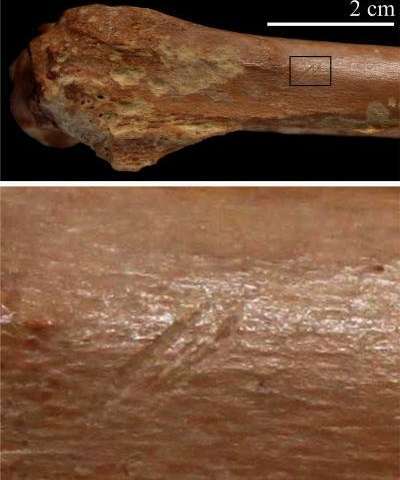 Isabel Cáceres, taphonomist at the IPHES, says, "The effective use of sharp-edged tools at Ain Boucherit suggests that our ancestors were not mere scavengers. It is not clear at this moment whether they hunted, but the evidence clearly shows that they were successfully competing with carnivores and enjoyed first access to animal carcasses." At this moment, the most important question is who made the stone tools discovered in Algeria. Hominin remains have still not been found in North Africa which are contemporary with the earliest stone artefacts. As a matter of fact, nor have any hominins yet been documented in direct association with the first stone tools known from East Africa. Nevertheless, a recent discovery in Ethiopia shows the presence of early Homo dated to 2.8 million years, most likely the best candidate also for the materials from East and North Africa. "Future research will focus on searching for human fossils in the nearby Miocene and Plio-Pleistocene deposits, looking for the tool-makers and even older stone tools," concludes Sahnouni. "our ancestors ventured into all corners of Africa, not just East Africa. The evidence from Algeria changes the earlier view that East Africa was the cradle of Humankind. Actually, the whole of Africa was the cradle of humankind,"
-Of course. Each successive technological advancement that protected humans from attrition by the natural elements caused successive spikes in overgrowth. People sought resources and refuge wherever they could be found. Some spikes were so severe that they drove humans across the deserts and northward into temperate and sub subarctic regions. Not unexpected after the finds of early modern humans in the area, it was at times attractive habitat as TGO notes, and the fossilization of them too (or we wouldn't know this). As a general reflection, the fossilization (and search) bias has long been known, the human fossil record is quite good while the chimps that prefers remaining forest habitats has left nothing much. That - the grassland evolution that suppressed the earlier megafauna and replaced it with herd animals - is also a factor that drove this "herd megafauna" ape that we are to populate Africa (and eventually other continents). So the next step is to try to connect the Oldowan technology with the identity of its users.